This cushioning yet supportive memory foam gently cradles the body while its unique open cell structure helps dissipate heat away from the sleep surface. It is now enhanced with Serta’s revolutionary EverTemp™ Technology, which allows this material to remain comfortable regardless of temperature or humidity. 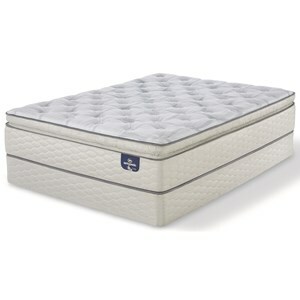 The Perfect Sleeper Somerville Cal King Firm Gel Memory Foam Mattress and MP III Adjustable Foundation by Serta at Casa Leaders Inc. in the Wilmington, Long Beach, Torrance, Lakewood, Los Angeles area. Product availability may vary. Contact us for the most current availability on this product. 5NSERSOMMFKM Cal King Firm Gel Memory Foam Mattress 1 12"
The Serta Perfect Sleeper Southpoint Firm Gel Memory Foam Mattress, combines an advanced Cool Action™ gel memory foam material plus a top layer of EverCool® Plus Memory Foam with an all-foam support core. This mattress is an ideal solution for those who prefer the contouring feel of an all-foam mattress. 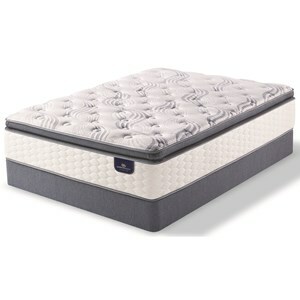 The Gel Memory Foam will let you sleep cooler while relieving your pressure points allowing you to sleep deeper, longer. This mattress would be very good for a back or side sleeper who likes a firmer feel. The Perfect Sleeper Somerville collection is a great option if you are looking for Mattresses in the Wilmington, Long Beach, Torrance, Lakewood, Los Angeles area. Browse other items in the Perfect Sleeper Somerville collection from Casa Leaders Inc. in the Wilmington, Long Beach, Torrance, Lakewood, Los Angeles area.